A large part of any business’s success can be traced back to communication, both internally and externally. How well a company is communicating with each other and with clients is a key indicator of its own health. Digital communication has become a driving force in the way we interact with each other in the office and how we choose to talk to our audience. Choosing not to integrate digital communication is comparable to standing on the train platform as the train chugs away without you. Services like text messaging, push notifications, and even social media must become an integral part of many companies’ communications strategies in order to adapt to a quickly changing landscape. The best way to guarantee your message reaches your audience is by communicating with them on the platforms they use most. Most consumers have their smartphones within reach through the majority of their day. Smartphone users watch movies, play games, check email, read the news, browse the web, scan social media, and perhaps most importantly, text. Automated messages that come through as text and push notifications are seen instantly as consumers have become conditioned to glance over at their phone every time they hear a ring. Research shows that SMS open rates are at 98%. Compare this to just 20% for email open rates. This incredibly high statistic for SMS open rates reflects the accessibility text message campaigns can benefit in audience reach. You can schedule when you’d like to send text messages to your customer base all at once. This comes in handy when you’re ready to promote a certain event or send reminder notifications. You can engage your client base by querying them with survey questions. By using the right questions and analyzing the answers, you can get to know your clientele better. Most text messaging services allow you to communicate directly with those who respond back to mass sent text messages. This brings a somewhat impersonal message into the realm of personal, thereby deepening your connection with your audience. Opt-In: Make sure your audience has the choice to opt-in to receive text messages. And be sure they can opt-out easily at any given time. Keep it Simple: The more concise you are, the more likely clients will be willing to read the next text that comes in from you. General advice is to stick to about 160 characters including spaces and punctuation. State Your Purpose - Tell your clients up front why you’re texting them, and what your call to action is. Creative is Best - Feel free to send funny quotes, quirky facts, and appreciation texts to keep your recipients entertained and more likely to open your texts in the future. Internal communication can be helped by incorporating a text message reminder system into daily operations. 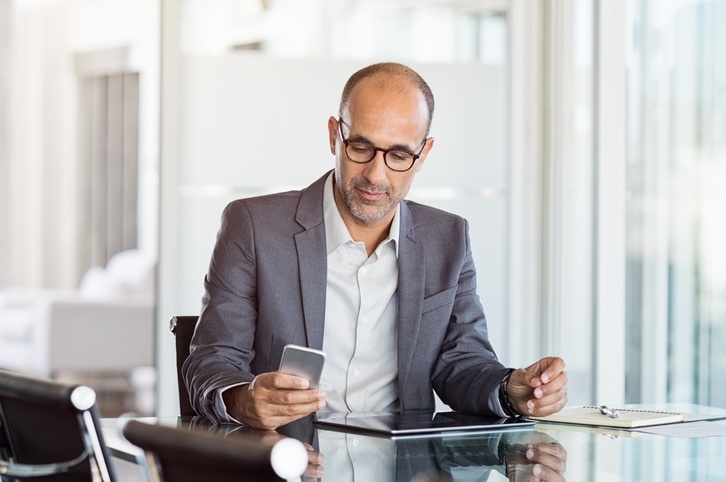 While some emails may get lost in the shuffle, or not everyone is present at the meeting when an important announcement was made, a text message, through a professional service like Call-Em-All, almost always gets opened and read. Meeting reminders - give employees a quick reminder that a meeting is coming up in an hour. It will especially help those employees who get sucked into work and lose track of time. Appointment scheduling - Make sure employees have easy and quick access to appointment scheduling so they can get meetings and meetups with clients on the books quickly. HR notices - Share links to important HR policy updates via text to ensure everyone is in compliance. Project deadlines - Help keep projects on schedule and under budget by sending regular reminders of upcoming deadlines. Facilities Notifications - Send helpful information about the work facility such as entrance closures to employees as a helpful tidbit to make their day easier. Upcoming To-Do Items - A little reminder of to-do lists keep employees on track with project goals in mind. General Reminders - General information and reminders about office happenings can reach a wide audience in an instant instead of relying on email and word of mouth. Cancellations - Don’t leave anyone out in the dark because they didn’t hear about the meeting cancellation this afternoon. Text everyone involved so they're in the know. Important Events - Keep employees abreast of important events so they have ample time and knowledge to clear their calendars for the important day. Scheduling Changes - This is particularly helpful in rapid, fast moving environments involving a large team with several interdependent shifts. Shift Coverage - Finding someone to cover a shift can be difficult. But if you can send a mass message out to the entire team at once, you may be more likely to identify someone who can cover a shift. Payroll Alerts - Employees specifically benefit from reminders to submit their time card to get paid on time. Whether your needs for texting encompasses internal communication, external communication, or both, the benefits of employing mass texting will be felt almost immediately.